This water-launched sounding rocket combined a NOTS 401A booster with a Sandhawk sustainer for two-stage flights. Prior to launch, the Hydra Sandhawk was submerged in ocean water, in a floating launcher, off the California coast. The sounding rocket soared to an altitude of 175 miles, carrying its scientific payload to the very edge of space. The kit includes laser-cut fins, four plywood centering rings, and other parts to build both booster and sustainer stages. 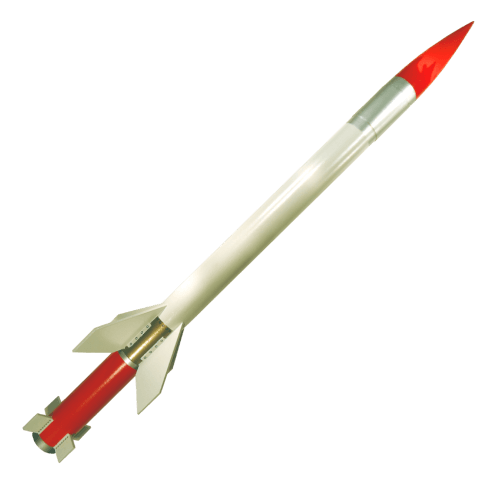 Build your own rocket kit today and relive aerospace history on a smaller scale. This rocket kit requires a launch rod (not included) and is not to be submerged in water. Simply enter your details below and we will send you an e-mail when “Hydra Sandhawk Model Rocket” is back in stock!